If you're ready to learn more about building wealth, you should take advice from those who have a proven track record. 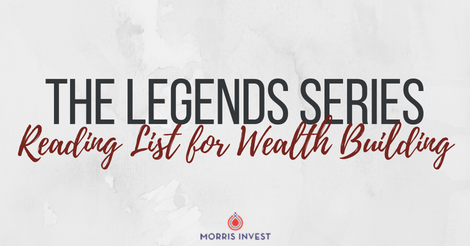 That's why we were so excited when we booked Robert Kiyosaki and his Rich Dad Advisors for our podcast series: The Legends! In case you missed it, you can hear the interviews here. Each of Kiyosaki's advisors is an author, so in this post we thought we'd share a quick roundup of the Rich Dad Advisors' books for wealth building! Rich Dad Poor Dad by Robert Kiyosaki - This book is the basics of all things wealth-building! Rich Dad Poor Dad is filled with invaluable pearls of wisdom about investing, having your money work for you, and gaining control of your finances. If you're ready for a paradigm shift about becoming wealthy, this is a great place to start. More Important Than Money: An Entrepreneur's Team by Robert Kiyosaki - Kiyosaki's newest book is based around the premise that no entrepreneur can do it all. If you want to learn about assembling the right team to support you in your business ventures, this one is for you. The ABCs of Real Estate Investing by Ken McElroy - In this book, real estate expert Ken McElroy shares how to achieve cash flow through real estate, what to look for in a deal, and dispels some of the biggest myths about investing! Little Voice Mastery by Blair Singer - A big part of wealth building is getting in the right mindset. Sales expert Blair Singer wrote this book to help you learn how to quiet the negative self-talk that stops you from reaching your potential. Tax-Free Wealth by Tom Wheelwright - As a real estate investor, you need to know how the tax laws work, and how they are designed to benefit you. Tom Wheelwright is one of the most knowledgeable tax accountants around, and his book will totally reframe the way you think about taxes! The Art of Raising Capital by Darren Weeks - In this book, capital raising expert Darren Weeks details everything you need to know about finding money for real estate deals. You'll learn proven strategies and systems you can implement to make your deals happen with private money.